LUTHERWALD is located in LaGrange County on 65 acres along South Twin Lake two miles west of Howe IN on SR 120. Open year-round, Lutherwald has a youth camp and the Kempski Center, a retreat and conference center that houses up to 50. LAKE LUTHER is located on 60 acres along Bell Lake in Steuben County at Nevada Mills, 7 miles northwest of Angola IN. Open from April-November, Lake Luther has a youth camp and a family campground with electric sites, guest cabins and boat launch. 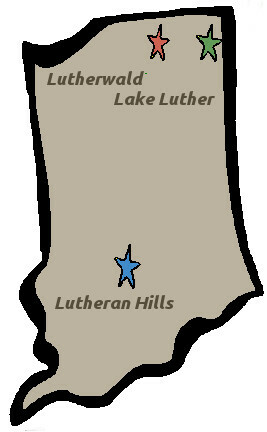 LUTHERAN HILLS is located in southern Indiana in Brown County near Nashville and Bloomington. It has 735 acres of rolling hills, seven miles of hiking trails, a swimming pool, and a seventeen acre lake. Lutheran Hills has a youth camp area and its Bear Creek Village retreat campus houses up to 40 and is open year-round.